A Microsoft smartwatch was rumoured to be arriving before Christmas and that's, almost, what has happened as the Redmond based tech giant has unleashed the Microsoft Band - its first attempt at taking on the likes of Garmin, Jawbone, Fitbit, Withings and, dare we say it, Apple, in the wearable tech revolution. With the features and spec sheet of the Microsoft Band officially revealed, it's clear we could be looking at the new top-dog of the fitness tracker genre. The Microsoft Band takes the form factor of a fitness tracker, rather than a smartwatch, although it does have many of the features of the latter (which we'll talk about later). The Band is made from a thermal plastic elastomer and features an adjustable fit clasp. There are three sizes available; small, medium and large, which equate to wrist height guideline measurements of 39mm, 41mm and 49mm. It weighs in at 60g and measures 19mm x 8.7mm. There are two physical buttons on the Microsoft Band, located under the display on the edge. These are used for a variety of controls including power settings, volume controls and navigation. The display is a capacitive 1.4-inch (11mm x 33mm) TFT full colour touchscreen, with a resolution of 320 x 106. While impressive, it's hardly eye-popping like the Samsung Gear S that boasts a 2-inch curved Super AMOLED display with a 480 x 360 resolution. It also lags behind the similar form-factored Samsung Gear Fit in the display stakes as well. Running the show is an ARM Cortex M4 MCU CPU and there's Bluetooth 4.0 on board for syncing with your smartphone. Internal storage is a pretty pathetic 64MB - so it doesn't look as if offline music storage and playback (like the recent Android Wear update provided) without a smartphone will be an option. However, the great news is that there is GPS connectivity built right into the Band, so there's no need to carry your smartphone around with you in order to accurately record and map your runs. This is a major step forward for the fitness band genre - although the Polar M400 also blurs the line between activity tracking and run recording with its GPS sensor and the Sony SmartWatch 3 will soon launch as the first Android Wear smartwatch packing GPS skills. There's also a UV monitor for assessing whether you need to sunscreen-up or not, and the sensor check-list continues with a 3-axis accelerometer / gyro, a gyrometer, an ambient light sensor, a skin temperature sensor and a galvanic skin response sensor. Finally, like the Intel Basis Peak and the Fitbit Charge duo, there is 24/7 heart rate monitoring on board thanks to the optical heart rate sensor. Rocking the Modern UI tiles that you would have seen on Windows 8 and Windows Phone devices, the Microsoft Band packs in all the usual activity recording functions that we've come to expect, such as step counting, calorie burn recording, and sleep quality analysis. You can view daily or weekly stats, set goals, and receive a virtual 'high-five' when you hit them. In real-time, the Microsoft Band lets you see how well you're doing against your activity goals by providing updates right on your wrist, and the Band learns about you over time to make the tracking and objectives more personal. Another trump card for the new fitness tracker are the guided workouts that are built right into the Band. This means programs and workouts from the likes of Gold's Gym, Shape and Men's Fitness with exercise prompts on the band and extra info in the app. Microsoft has not made the foolish decision of locking its Band into the Windows Phone platform - it plays nicely with Android and iOS as well. All of the apps are free and you can download them right now. Microsoft has also unveiled its Google Fit and Apple Health rival - Microsoft Health: "A new service that helps you live healthier by providing actionable insights based on data gathered from the fitness devices and apps that you use every day. It's designed to work for you, no matter what phone you have, device you wear, or services you use. Similar to the efforts we've seen emerge from Mountain View and Cupertino, Microsoft Health will attempt to be a one stop shop for all your health and fitness data; drawing in information from not only the new Microsoft Band, but from third-party hardware and apps as well. Partners such as RunKeeper, MapMyFitness, Jawbone and MyFitnessPal are already on board with Microsoft Health and the company is planning further collaborations. The Microsoft Band boasts some smartwatch skills such as email previews and calendar reminders, as well as call, text, social media, weather and finance information. You'll be able to choose which alerts you want to see on your wrist and change the notification settings on your phone from within the app. Twitter and Facebook compatibly is already on board, and you can also load your Starbucks card onto the band for easy coffee, or Michael Bublé CD, purchasing. If you use Cortana on your Windows Phone 8 mobile, those notifications will also show up on your wrist. Microsoft is stating two days battery life and just 1.5 hours for a full charge for its new Band. The battery on board is a dual 100mAh rechargeable lithium-ion polymer one, which is almost on par with the 210mAh one found in the similarly designed Gear Fit. We'd expect the GPS connectivity to give that two day life a fair old kicking but we'll reserve judgement until we've had time to compile our full Microsoft Band review. Like most wearables, you'll need a separate accessory for charging; the Microsoft Band ships with a magnetic-clip USB cable. The Band is splash and sweat proof, but not water resistant, so no swimming data can be recorded. 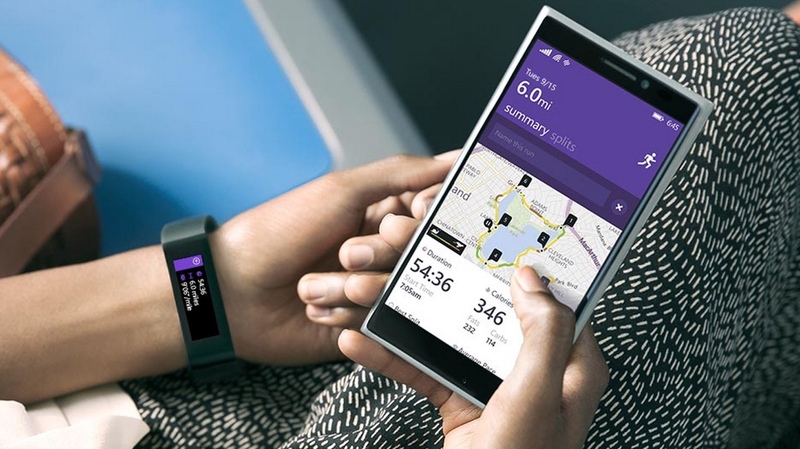 The Microsoft Band costs $199 in the States, UK pricing and a UK Microsoft band release date are still to be confirmed.